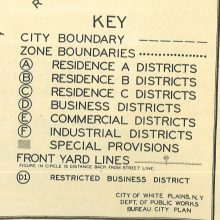 Tags: Brookfield Street, chamber of commerce, city planning, daily reporter, downtown, local-history, slum clearance, urban development, urban planning, urban redevelopment, Urban Renewal, water street, white plains collection, white plains history, and winchester street. People & Stories Oral History Project: Teddy Lee, Jr. Tags: African-American History, Black History, Brookfield Street, business, history, local history, oral history, People & Stories, Teddy Lee, and white plains history.